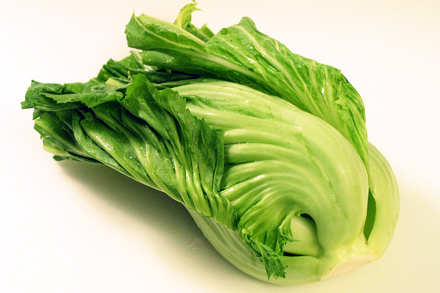 Many Chinese vegetables are known to Americans as bok choy or simply Chinese cabbage. Although there is a wide variety of these “Chinese cabbages,” they all have a very similar, neutral, non-threatening taste recognizable to the American palate. But don’t be fooled, not all Chinese vegetables are bland and blah. There is also a large selection of mustard greens, not commonly known by Americans, that have much more distinct bitter and spicy flavors. One common mustard green widely consumed in Southern China and Southeast Asia is known as jie cai (芥菜) in Mandarin or gai choy in Cantonese. 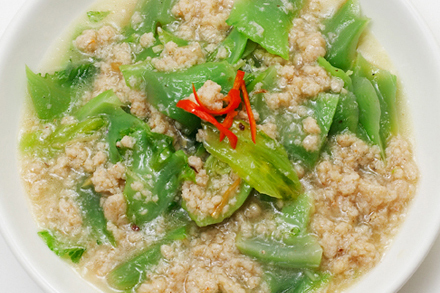 Jie cai is one of my favorite vegetables because of its robust taste that reminds me of mild horseradish. 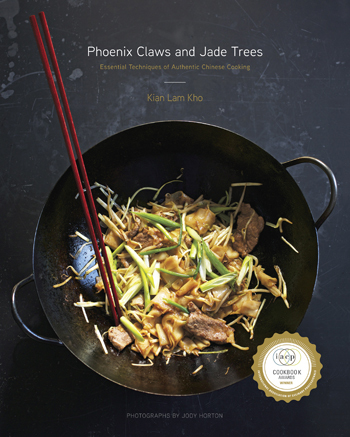 Many dishes from my family province of Fujian use jie cai as an ingredient. It is used fresh in stir-fries, cooked with rice, or made into soup. In fact a rustic Fujian specialty of mustard green rice (閩南芥菜飯), which I often crave whenever I feel homesick, is made with pork belly, jie cai and dried oyster. Jie cai is regularly pickled in brine and is known as xian cai (鹹菜) or suan cai (酸菜). This pickled green is used in a wide variety of dishes such as steamed and stewed fish, or pickled green soup. The pickling process neutralizes the bitterness and results in a slightly sweet fermented taste. A very elegant way to prepare this vegetable is to stir-fry it with crabmeat. I remember tasting this dish for the first time in an elegant banquet when I was a teenager. It was the first time I realized jie cai is not just an ordinary daily vegetable, but can be transformed into a complex and refined dish. When perfectly cooked the bitterness in the green contrasts with the sweetness in the crabmeat and the outcome is simply heavenly. Here is a recipe I’ve often used to entertain my guests and was one of my Chinese New Year banquet dishes. Cut the leafy portion of mustard green off, and then cut the green stem into approximately 1.5-inch square pieces. 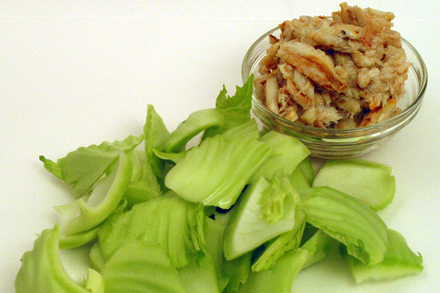 Use fresh or refrigerated cooked crabmeat if available. Otherwise canned crabmeat can be substituted. Heat two tablespoons vegetable oil in a wok until beginning to smoke. Put the mustard green in the wok and add 1/2 cup of stock or water. Cover the wok and simmer over medium heat for about 8 minutes. Stir the vegetable occasionally to make sure it is evenly cooked. When the vegetable is cooked and tender, but not mushy, remove it from the wok along with all the liquid and put it in a bowl. Set aside. Heat another one tablespoon of vegetable oil in the wok and stir-fry the garlic and ginger for about a minute. Add the crabmeat, cooking wine, salt, pepper and the rest of the stock or water. Cook for another two minutes or so and return the vegetable and its liquid into the wok. Thicken the sauce with the cornstarch slurry. Plate and serve immediately. To make it even more elegant garnish the dish with a sprinkle of cooked crab roe. Looks delish. Will have to try this sometime. My grandfather is from Fujian and he always made the mustard green rice when I was growing up, although his never had dried oysters in it. My favourite part was the deep-fried shallot topping, do you know if that’s traditional? Michele, Deep-fried shallot is in fact traditional in Fujian and Chaozhou cuisine. It is used to garnish many dishes including congee, dimsum, rice dishes and others. And yes, we use dried oysters in the mustard green rice. They infuse a mild pungent seafood flavoring to the dish. Kian, I enjoy your site very much! You put a lot of effort in setting up elaborate chinese banquets. That’s awesome! To me it’s something that can only be done with many,many helping hands in the kitchen. Now with mustard green, there’s slight bitterness when you stir fry it; any idea how to rid of it. i actually like the taste, but my husband thinks it’s too bitter and chewy. thanks for your response. Hi Rose, I’m glad you’re enjoying Red Cook. As for the mustard greens you can try soaking the cut vegetables in slightly salted water for about 15-20 minutes. But be sure to adjust any salt added during cooking. It will take the edge off the bitterness but will not remove it completely. On the other hand the bitterness is what makes mustard greens unique.